I about had a heart attack when I saw this tweet about 5:30 on Tuesday. Needless to say, I ate my gyro and salad in a hurry so that I could sit and watch his debut. This would be my first time seeing Velazquez play live. I was expecting him to debut in Eugene next month after suffering an injury at the end of spring training. The 19-year-old came across with some impressive skills in the field, at the plate, and on the basepaths, all in one night. In his first at-bat, he looked good laying off some pitches before he doubled on a curve down and in. He seemed to just flick his wrists as he sped down the line and on to second as the ball took a funny hop off the side wall. He wound up stranded at third despite leading off. In the top of the third, he caught a fly to right and showed off a canon for an arm on a throw to third. He didn’t get the runner as it was off a bit, but impressive nonetheless. The knock on Velazquez heading into this year was he struck out a lot. In the regular season, his K% while in Mesa was at 30%. In the playoffs, it was almost at 50% even though he hit 2 HRs, drove in 9, while hitting .304 with a .385 OBP in 5 games leading the Cubs to a championship. Last night, he looked very much in charge of his own swing. In his second at-bat, he worked the count after being down 0-2. He laid off a couple of curves and recognized the ball spin quickly and tracked the ball on its path to a conclusion. He ultimately hit a high popup deep into right center, but the approach was excellent. That’s a good sign! In the bottom of the sixth, Velazquez came up for the third time. The 6’2″ 200 lb. right-handed hitting outfielder quickly fell behind 0-2 swinging at two fastballs in the zone. He laid off the curve for ball one. Then he got called out on strikes as the pitcher painted the outside corner with a fastball. While he did not get a hit, his approach was good. When Velazquez came up in the bottom of the 8th, men were on first and second with one out. He swung mightily at the first pitch and shattered his bat on the second. He watched a slider go by and then he got caught looking at a fastball low and away again. South Bend announcer Darin Pritchet quipped that Velazquez might have been looking for a breaking ball. Regardless, Velazquez needs to either go the other way with that type of pitch or learn to foul it off. Overall, Velazquez is very raw. It is evident that he has a lot of tools – arm, glove, speed, bat, and power. 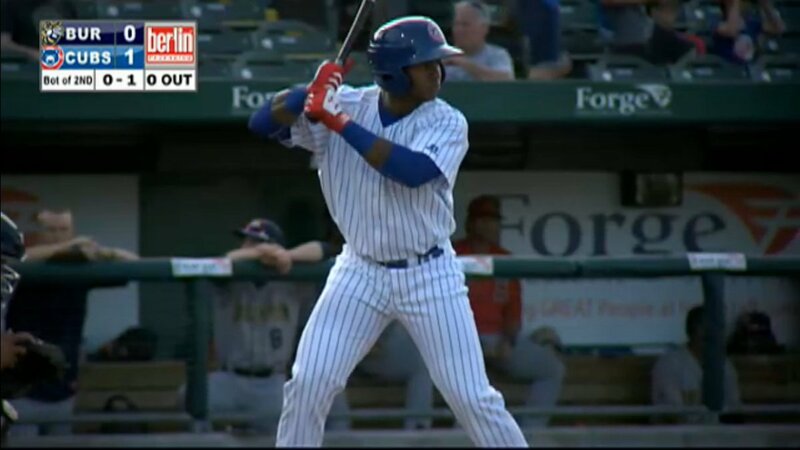 Although he did not go yard, going 1-for-4 with a 2B and 2 Ks is alright for a debut at low class A at the age of 19. It is going to be up to Manager Jimmy Gonzalez and his staff to help polish those skills over the course of this summer. Gonzalez has excelled in improving pitch recognition and game decisions with many young Cub prospects the past couple of years. At the plate, Velazquez is going to face pitchers and pitches he is not accustomed to seeing. He should be one of the most interesting follows as he uses his talented set of tools to learn to adjust and adjust again and again. I already can’t wait for tomorrow’s game! The 6 Pack – Promotions Coming?